Princess Mini goes on a class trip with all of the other students at the Royal Fairy Academy in this third super-sweet Aladdin QUIX story. Princess Mini’s wish is finally coming true: her class is going to see the Sugar Crown Jewels! She has always dreamt of seeing the sparkly purple and pink, gold and silver gems and can’t wait to see the dazzling display at the Chocolate Museum. But when the class arrives, the jewels are nowhere to be seen! Oh no! Were they stolen? Can Mini and her fairy friends solve the mystery? 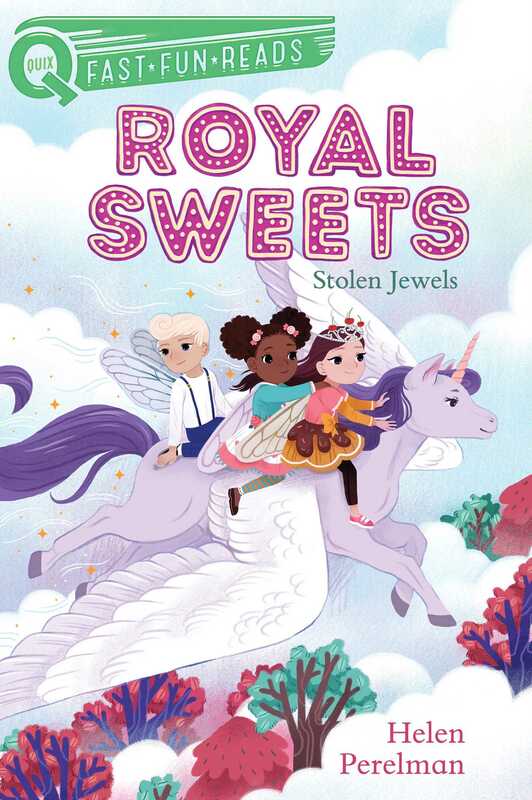 Read all about Princess Mini and her merry mis-adventures at Royal Fairy Academy, in a new Royal Sweets book by Helen Perelman, author of the beloved Candy Fairies series. “Lady Cherry, where is our class going?” Prince Frosting asked our teacher. He was my cousin and in my first-year class at Royal Fairy Academy. “Oh, I hope it is someplace super sweet!” Princess Cupcake said. She was Frosting’s twin sister. They were as different as fruit chews and lemon drops. Lady Cherry clapped her hands. “I am going to write a clue on the board,” she told the students. I looked and saw . . .
“Are we going to Sour Forest?” Prince Frosting asked, flying out of his seat. He always forgot to raise his hand before speaking. Lady Cherry gave Prince Frosting a stern look. “Please stay in your seat and remember to raise your hand,” she said. “No, not Sour Forest.” She looked around the room. I thought I knew the answer. My parents were the ruling fairy princess and prince of Candy Kingdom. They had told me about a new royal crown jewels exhibit at the Chocolate Museum. I raised my hand. “The royal crown jewels at the Chocolate Museum?” I asked. “Yes, Mini! That’s correct,” Lady Cherry happily exclaimed. I smiled at Taffy. She was my best friend and the sweetest Candy Fairy I knew. “But the jewels don’t really belong to her,” Princess Cupcake said. Taffy leaned closer to me. “She’s just jealous that Queen Swirl isn’t from her side of the family,” she whispered. “Have you ever seen the special royal crown?” Cupcake asked. Olivia Chin Mueller grew up in Chester, Connecticut, and now lives in Los Angeles, California. She attended the Rhode Island School of Design and graduated with a BFA in 2014. Besides illustrating, Olivia loves playing with her cats, raising silk moths, and also enjoys sewing and felting plush animals of her own.